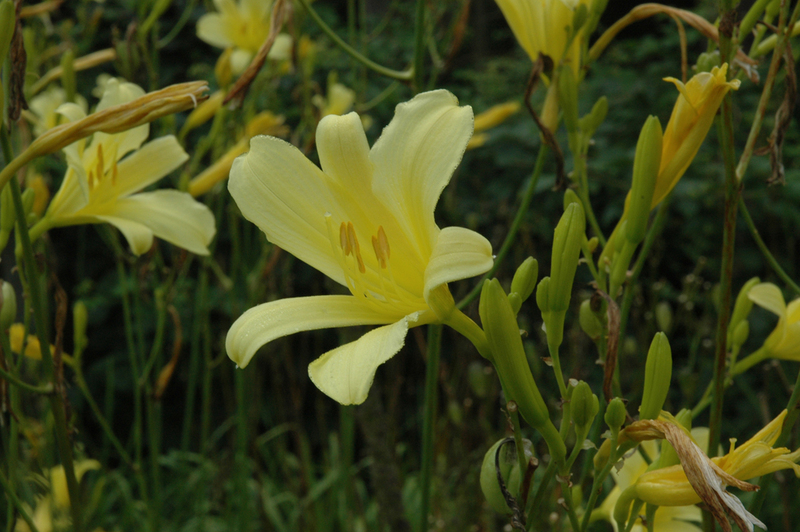 Our experience here at Olallie Daylily Gardens is that the species always seem to strike a chord in people. It may be that with all the fancy ruffles and eyezones of current hybrids, the pure clean lines of the species are particularly appealing. One area in need of investigation is the use of daylilies in cooking. There has been some research that indicates that different daylily cultivars differ in flavor in many ways. In China the daylilies are used extensively in cooking. The spent blossoms, buds, shoots and even the roots are edible and used in cooking in Asia. 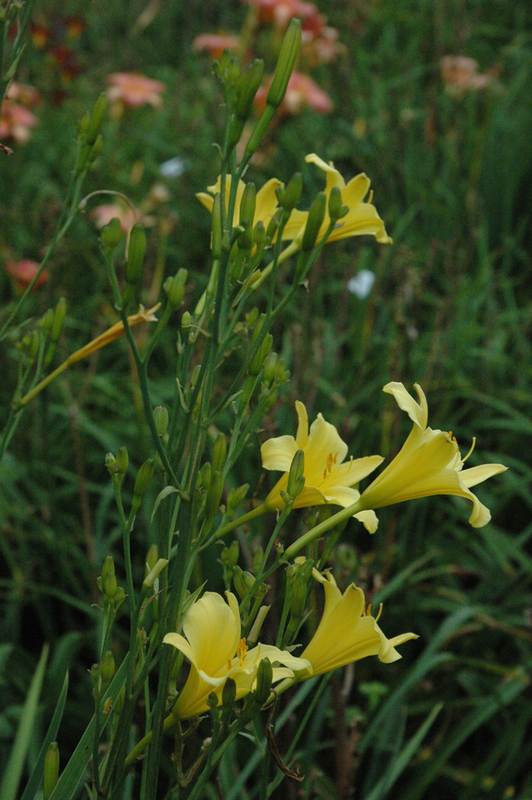 The species featured on this page are later-season bloomers and typically are tall. 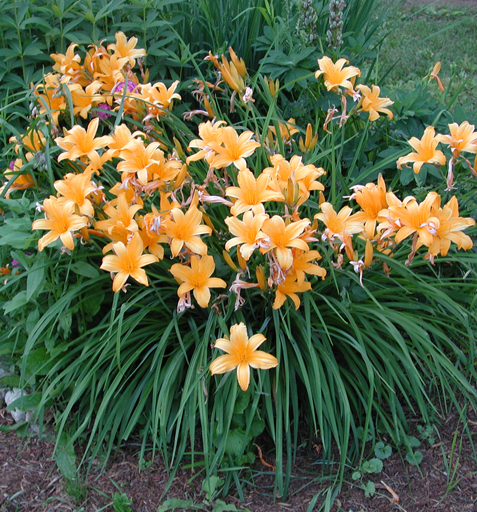 The miscellaneous species listed are daylilies which we grow that are or could be species. Cultivars such as Tetrinas Daughter are interesting as they are tetraploid deratives of H. citrina. Japan Hybrid in full bloom 6/26/07. appears virtually identical to H. citrina vespertina but blooms about 2 weeks later and thus into September. Hybrids of Hemerocallis citrina vespertina and Hemerocallis citrina thunbergii display many interesting traits including petal shape, yellow shades and scape height. Hybrids almost 7 feet tall are possible. is typically described as having orange colored blooms. This variant is more yellow and came from Dr George Darrow. 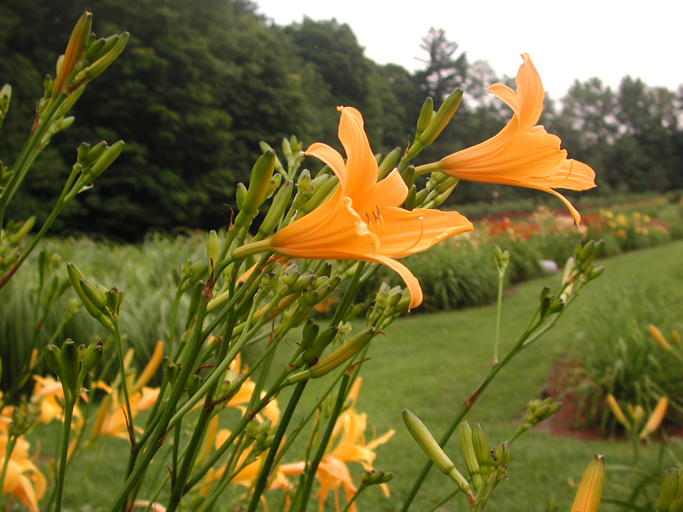 Hemerocallis multiflora produces such a profusion of blooms and tiny seed pods. is a particularly late blooming species, beginning in mid to late August here in Vermont. The coloration and spreading habit seem to indicate a relation to Hem. fulva. 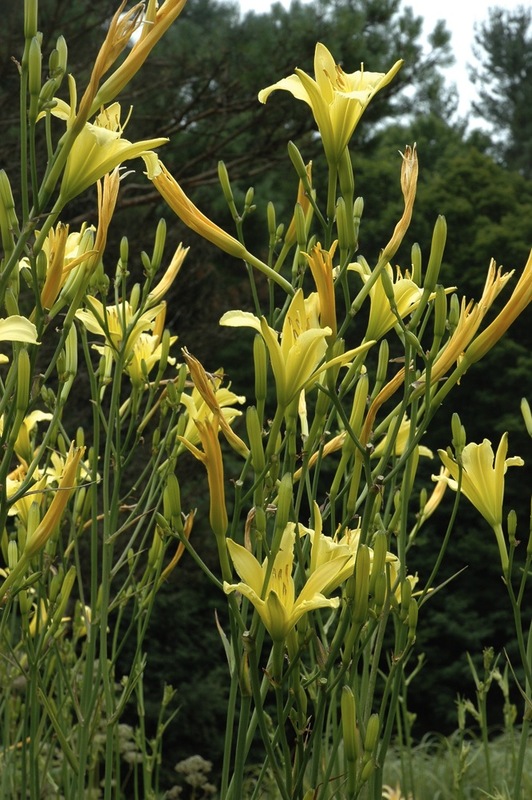 The foliage of Hemerocallis sempervirens exhibits a somewhat loose spreading habit but doesn't increase as quickly and aggresively as H. fulva. Hemerocallis coreana is a relatively new acquisition. H. coreana does not seem to be a very vigorous bloomer here in Vermont. This cultivar could very well be H. citrina except that it didn't come from Dr Darrow's original collection and was never labellled as H. citrina. This hybrid of Hem. citrina and Hem. hakuensis exhibits some of the characteristics of both species, the lemon yellow color of H. citrina and the trumpt shape of H. hakuensis. 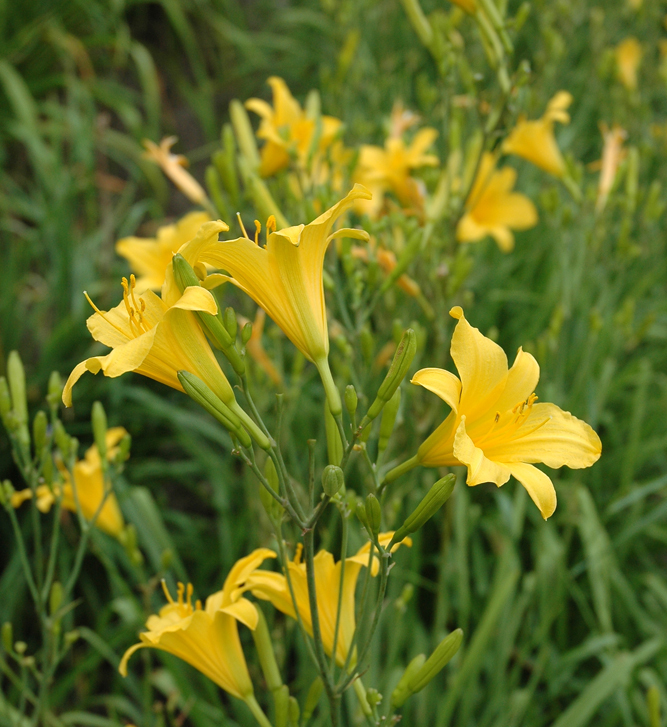 Hemerocallis multiflora type is one of our cultivar which fits most of the criteria of H. multiflora but just isn't as floriferous as our origanal H. multiflora. Tetrina's Daughter' is a tetraploid derivative of H. citrina, with many of the charactristics of H. citrina. Tetrina's Grandson is a recent acquisition and as such not much is known about it other than it is another tetraploid derivative of H. citrina.